A complete range of the very best coin operated football tables and foosball for commercial use. Lowest prices. All with free delivery! Our comprehensive range of coin operated football tables includes the football table of champions. The Garlando World Champion table has been used by the British Football Association in various events. This is the official ITSF football table. We also stock the best selling Silver Olympic, the Red White and Blue table and the elegant Coperto Deluxe. These football tables can be seen in pubs and clubs throughout the country. All these tables can be used as a money box or set on freeplay mode. If you are serious about table football then these are for you. 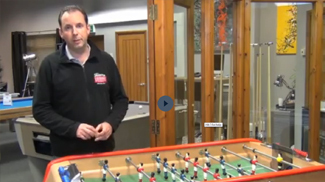 We have a great range of foosball table buying guides, foosball tips and tricks along with how to care for your foosball table in our resources section. All of our foosball tables come with free delivery and we also offer a great range of foosball table accessories you might need. Whatever you are looking for we should have covered, if you have any queries at all just give us a call on 0800 622 6464 and one of our friendly expert advisors will be able to help you. We also deal with the luxury range of Bonzini tables that are ideal for commercial environments where style is key. The B90 is an iconic foosball table that you will find all across Europe in some of the coolest cafe, bars and clubs. It is a stunning coin mechanism football table that gets tongue wagging! All of our tables incorporate the ultimate in playability with outstanding practicality to provide the operator with a trouble free game which will attract customers to the location as well as provide a fast payback on the initial investment. All of the tables we sell are made to extremely high standards and we pride ourselves in only committing to promote and sell the very best that the UK Table Football market has to offer.